When I'm reviewing books, I sometimes feel torn. When I've met an author and really like him or her, I want to write a glowing review. But I also feel like it's my moral obligation to be honest. Here's me being honest. I had food poisoning over the weekend and spent all day Saturday sleeping on and off. I was cranky, and in the moments when I wasn't sleeping, I read Crossed. I could use the state of my intestinal tract and my tired brain to explain why this book didn't really do it for me, but then I think back to when I read Matched last year, and I was underwhelmed by that too. Really, I don't think it has a lot to do with the writing. I think Condie writes beautifully, and I was impressed by the way she adapted the Southern Utah landscape of her childhood to a dystopian novel. I also love, love, love the way she interweaves great classic poems into her texts. On those two points alone, I want my kids to read this book. I also love the way she includes the cave paintings into this one. The details are fantastic. The problem for me is probably my own, and it's a lot more basic. First of all, I think that the romance that drives the books gets old. The romance more than the life situation seems to be the driving force in both of the books so far, at least for Cassia, the seventeen-year-old protagonist. Okay, I'll admit that when I was seventeen I was pretty boy crazy myself, and there was no expectation that I should be matched off or married at that age, so I guess it makes sense. The thing that I'm having a hard time reconciling in this series is that I think Cassia is going for the wrong guy. Maybe lots of girls (Cassia, Taylor Swift, Demi Moore) want the bad boy instead of the one who is plodding along within the system (or is he?) but I fell hard for Xander, probably because he reminds me so much of my own lifelong match, that every time she talks about her love for Ky, I want to shake her and tell her to rethink her options. For me I'd give it 8/10. Part of that may be the shiny fun Kindle glow, though. I loved the writing. I thought it was worth reading for the sheer excellence and wisdom of the writing. I loved the landscape, like you. I loved the poetry woven in. Ky also bugged me too. There's something about the intensity and angst of that kind of relationship that doesn't sit well with me. I was so happy when they had a fight. It felt like she was finally getting a clue. Also, sometimes I lost the thread of the plot because I was caught up in her excellent writing, and I had to shake myself and figure out what was actually happening. It's not a bad problem to have, though. I read it yesterday while in bed with such a head cold I thought it must be strep, and I know I'm thick-headed right now, so that might be part of why it didn't quite grab me the same way that Matched did (which I adored). It felt so very teenagery romance to me, too. Like that kind of passionate devotion to a boy, that kind of keening and no-sacrifice-too-great commitment didn't seem realistic based on their history. That kind of love is possible, but I just didn't see it develop between Ky and Cassia. Meanwhile, I did I detect a little twist in the plot that could possibly result in a change in devotions in the future? It gave me hope. 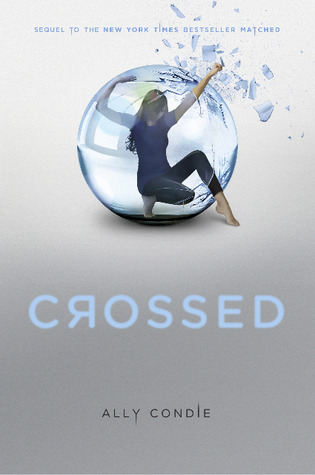 So not as big a fan of Crossed, but still plan to read the rest of the series. And I still enjoy Ally's writing. I'm a fan. I'm in the middle of crossed right now--and I'm with you on this. I like Xander much better than Ky. I'm interested to see how Ally spins this out in her third book. She said she put parts of her husband in both characters, so there's still hope for Xander.